Intermittent rain saw the majority of riders shelter inside the pits until the final hour, Petrucci making the most of dry track time. 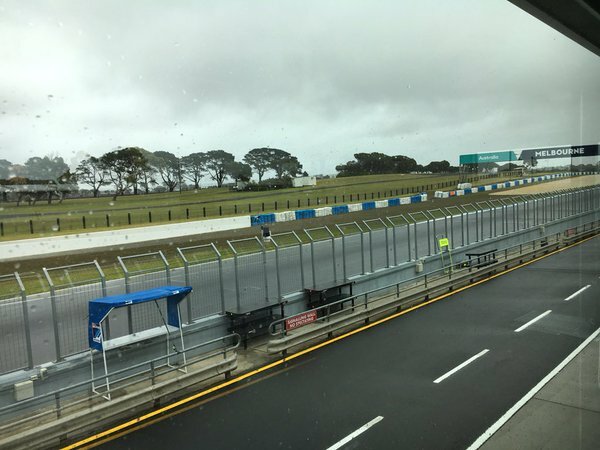 The Phillip Island Circuit is known for often producing four seasons in just a single day and the first day of the second official MotoGP™ test proved no different. Riders were greeted with overcast skies and a wet track as they entered the circuit on Wednesday morning. This saw a slow start to proceedings with Repsol Honda Team’s Dani Pedrosa the first to head out on wet tyres. 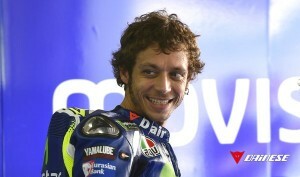 Fellow Honda riders Tito Rabat and Cal Crutchlow soon followed. Both of the Repsol Honda riders had the latest 2016 ‘evo’ engine while Crutchlow and Rabat were equipped with a 2015 engine and 2016 engine with a similar spec to that which the factory team tested in Valencia at the end of 2015. The rain meant that no major tests for any manufacturer could take place, but did allow teams and riders to further their understanding of how the Michelin tyres and Magenti Marelli software work in the wet. Valentino Rossi, who turned 37 the day before the test, ventured out with the 2016 bike featuring the fuel tank in the rear. Meanwhile his Movistar Yamaha MotoGP teammate, Jorge Lorenzo, completed 22 laps in the wet, the most wet laps of any rider. As the first day of testing approached the midway point, the rain eased and allowed Marc Marquez to venture out on the new intermediate tyre. Marquez, who celebrated his birthday on the opening day of the test, led the majority of the session with a 1’35.354 as only 11 riders had chosen to lap in the wet. Hope was offered as the final two hours began, the track beginning to dry and a flurry of riders heading out as a brief dry window opened in the closing hour. Times quickly dropped as the Octo Pramac Yakhnich pair of Danilo Petrucci and Scott Redding fitted slicks, the pair sitting 1-2 until the closing stages of the session. On and off showers continued after the initial dry spell with riders able to head back out on track with just 20 minutes remaining for one final dry run. Maverick Viñales and Bradley Smith would be amongst the biggest improvers in the final 20 minutes, the pair pulling themselves into the top three and within a second of Petrucci’s best time. Petrucci’s time of 1’31.764 would be the best of the day, but over two second’s off Marquez’s fastest race lap of 2015, a 1’29.280. Meanwhile his teammate, Scott Redding, was fourth and 1.100s behind but completed a total of 41 laps, the most of any rider. Both Crutchlow and Rossi, who had done the majority of their laps in the wet and missed the first dry window, entered the circuit in the closing minutes to improve to fifth and sixth. Pol Espargaro was another to benefit from improved track conditions as he set a 1’33.126, placing him seventh. The trio were the only other riders within two seconds of Petrucci, the Italian having now led two days of testing in 2016. Australia’s Jack Miller was back and riding his Marc VDS Racing Team Honda for the first time since breaking his right leg. The young Townsville native and his team had aimed to do just 25 laps a day in order to assess the condition of his still healing leg, but conditions reduced his lap count to just six on Wednesday. He was still able to set a time of 1’33.992 for the ninth fastest time of the day, putting him just behind Yonny Hernandez on the Aspar MotoGP Team Ducati GP14.2. 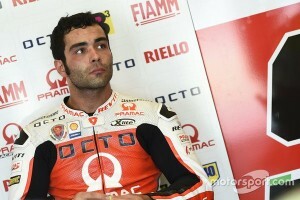 The Colombian beat both factory Ducati riders with Iannone in tenth. Iannone had attempted to go out earlier in the day during an initial dry spell, but rain quickly ended his lap. Andrea Dovizioso had been on track but did not register a time. 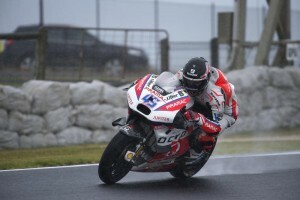 Neither of the Avintia Racing Ducati riders decided to circulate in the uncertain conditions. In 11th was Tito Rabat, the lone rookie in the MotoGP™ World Championship setting his fastest time, a 1’35.273, on his 28th lap and leading Marc Marquez. In 12th, Marquez did not improve on his 1’35.354 from earlier in the day. With just two laps on track, Aleix Espargaro closed the first day of testing in Phillip Island in 13th, just ahead of Eugene Laverty. Suzuki test rider, Takuya Tsuda, also benefitted from the dry window and ended 15th. Tsuda and Hiroshi Aoyama were at Phillip Island before the beginning of the official test as part of the Suzuki and Honda test teams with Tsuda testing the fully seamless gearbox for Suzuki. Suzuki aim to give both Espargaro and Viñales the fully seamless gearbox in Qatar while both the factory riders aim to get the full potential out of their new engine. 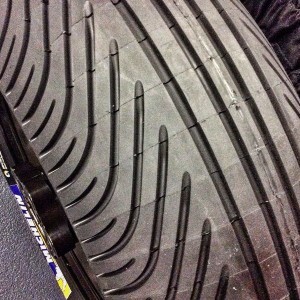 Dry track is needed for this however. 2015 MotoGP™ World Champion, Jorge Lorenzo ended 16th ahead of Dani Pedrosa as neither rider improved upon their wet weather times. Fortunately testing resumes tomorrow on the 18th of February at 09:45 AM Local Time, riders hoping for more consistent and dry conditions.